We are a team of professionals who are presenting a unique solution powered by digital technology, for buyers who are stuck with their investment in property with an endless wait for possession. 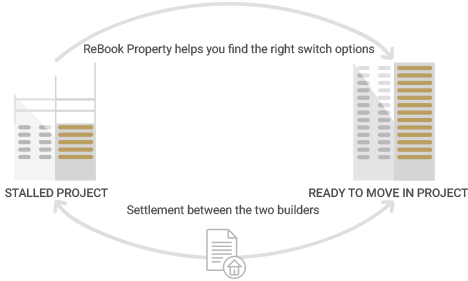 The ReBook Property platform will assist you in switching your 'waiting for possession' property with a 'ready for possession' property. We have carefully curated a list of matching properties which could be suitable alternatives to your current investment. All you need to do is, select the ones you need to see personally and book a site visit. Once you have selected your alternate dream home, we will assist you in executing the switch. Let us understand this by an example of Mr Amit. 10-Sep-2017 Amit’s booking amount at Ashwood Greens is adjusted for booking at Deerfield Gold project. 12-Sep-2017 Amit gets Allotment Letter from Deerfield Gold. In the end Rebook Property turns Amit in to a happy homebuyer. Please leave your contact details with us. Tell us about your existing property booking and also about your preferred project with which you would like to switch and we will try to find a rebooking solution for you.